ASL student and teacher ought to keep "handy!"" ASL its own unique language. Start ASL has done it again!" recommend this book to anyone who needs to master ASL as a second language." all of the grammatical aspects of ASL to form a complete idea is not easy for the beginning signer. grammatical and conceptual nature of ASL. The book is very user friendly and structured well." 5.0 out of 5 starsLearned so much from this book! This is a must have in the library of any person interested in or learning ASL (American Sign Language). This book includes more than just how to form the signs correctly it gives background information on how to use the signs in ASL and in which instances there are other acceptable interpretations. Anyone from a very new beginner to a more advanced learner can find very useful information. The illustrations are very easy to under and the explanations are covered with very clear examples. I am using this book side-by-side with my course material. You will be happy you made this purchase. This has been a very helpful book for me as an ASL student as well as a mother of a child who is hoh. I took 5 college ASL classes but still really struggled with ASL sentence structure. This book has what is called 'gloss' which means that they put the signs with English words in ASL sentence structure. It has been really helpful for me in learning ASL sentence structure although my teacher discourages this book because sentence structure in ASL can change depending on what you are putting emphasis on. For college we used Signing Naturally and we had the older version of the book. I really like the new one but really wish both of them focused on sentence structure like this one does for the students rather than just giving them a bunch of vocabulary although I might buy the new Signing Naturally because of the cultural and history that is added into it. 5.0 out of 5 starsLOVE-IT! 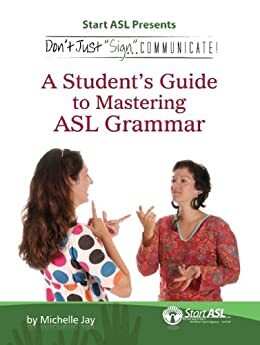 I ordered A Student's Guide to Mastering ASL Grammar during my first semester of ASL. I highly recommend this wonderful book if you are a beginning ASL student. After our "Deaf for a Day" assignment, I wrote up my experience using ASL grammar, which my teacher really liked. I could not have done it without reading this book. In addition to all the grammatical features, there are sections on numbers and fingerspelling that are very helpful. I am currently a student studying ASL/Interpreter Training. I am always looking for ways to suppliment what I learn at college,these books were AMAZING! I honestly think they are better thant he textbooks I used this past semester in a very well respected ITP program. I would definetly recommend Michelle Jay's books to anyone who wants to learn "real" ASL, not just some watered down version of a mix of ASL and English. I have purchased all 3 books available by Ms.Jay and can't wait to share them with my fellow students and my ASL professors. Bonus :) Michelle is a CODA(Child of Deaf Adults), so she really knows her ASL/Deaf Culture! 5.0 out of 5 starsCrucial! !